Remember when you built things out of LEGO as a child, imagining what it would be like to ride and fight with them? This is pretty much that. Test Robot : Exactly What It Says on the Tin, takes you to a test area where you can check your bots abilities before bringing it to actual combat. VS AI : Spawns you on one of the maps against AI-controlled robots to fight in a Team Deathmatch copy. You can get random item Crates in this mode. Team Deathmatch : Two 5-player teams put against each other on a small map. Victory is achieved by either team scoring enough kills (number depends on the players CPU levels). Unlike some of the the Brawls, this mode does feature respawn. Battle Arena : A game mode with respawn where two 5-player teams are put against each other. Victory is achieved by charging your Annihilator orbital weapon through capturing and maintaining mining stations before the enemy does the same with theirs. Each player's score at the end of the game decides whether their MMR (Matchmaking Rating) will increase, stay the same, or decrease. League Arena : Almost identical to the Battle Arena, except with better rewards, double experience earning and presence of the League rating, which, much like the MMR, can increase, stay the same, or decrease, depending on the result of battle. Brawl : Replacing The Pit and Elimination, players are paired up in two teams and set out to eradicate the other team, with various rules set upon the players to make things interesting. Custom Games : Create a customized match with a user-determined map, team sizes, game modes, and various other mechanics, with directly invited participants. The game was finally released at 24.08.2017 and is greenlit on Steam where it can be downloaded and played from. You can find the main website here . A Child Shall Lead Them: After Lord Adsoy killed Emperor Fanelli, Brotherhood of Q'An, lead by the Child-Emperor J. Bentley-Allen the Liberator (12 years old), took the CF-Alliance's capital under it's control. Adam Smith Hates Your Guts: While basic chassis cubes cost only 10 Robits, functional parts' cost increase exponentially as you level up. For instance, the low ranking "Wasp" variant of the game's SMG cost only 400 Robits, but the high-ranking "Leviathan" variant costs more than a hundred thousand of them. Given that recycling parts gives you only a fraction of the Robits needed to forge it, this is actually worse than it sounds. For a non-premium player, you need to recycle nearly twenty thousand of the Wasp lasers to afford a Leviathan- and as a non-Premium player, you're only getting half the items in each loot box. After the 0.13.2186 update, robits also appear in crates, making this situation slightly better. And I Must Scream: Losing all your weaponry and means of movement basically amounts to this. You are incapable of doing anything, just sitting there as a clump of wreckage waiting for death, or if you're lucky enough, auto-regen after a while. Anti-Air: The Aeroflak Sentinel and Aeroflak Guardian. Anti-Rage Quitting: Leaving a battle more than twice in a row incurs a five-minute join penalty. Allegedly Free Game: After the Epic Loot update, Robocraft is this. Robot parts drop in crates (ranging from Rusty to Protonium) which have anywhere from 4 to 8 items in them; however, if you're not a Premium player, only the front row of those items is available to you; if a Legendary drops in the back, too bad. Your robit recycle rate, the only way to choose what items you want, is also crippled; a premium player receives 2/3rds of the robits required to forge an item fresh from the shop when recycling it; a Ft P player receives 1/6th, on top of the fact that they're only getting half as many items in the first place. You also level up more slowly, which denies access to the 8-item Protonium crates given to you on level up, and to cap it all off your access to the only other means of gaining robits, the shop, is limited. Essentially, if you don't want your progress to be utterly crippled, you need Premium. Somewhat mitigated by the 0.13.2186 update, which makes robits also drop in crates, while also rebalancing item drops. After this update, there's a decent chance you'll get thousand or several of robits per crate. All There in the Manual: The only way to learn about the Robocraft universe in-depth is to read "Robonews" and "Daily Robot" on the official site of the game. Applied Phlebotinum: Protonium-511, which can stabilize nuclear fusion reaction and, somehow, enhance one's mental abilities. Arbitrary Maximum Range: Barely noticeable, as all the guns (bar Ion shotguns, which play the usual shotgun trope straight, Lock-On Missile Launchers, whose firing range is based on missile's pretty limited flight time, and Proto-Seekers) have the same range limit, which is pretty freaking far. Though at the same time you can't shoot people from, say, halfway across the map. Author Avatar: Most of the named people in both "Robonews" and "Daily Robot" are based on game's developers. Many early Megabot builds fell into this trope due to many players adopting a "charge in headfirst and crush everything" playstyle, which sounds good on paper but fails utterly in practice because not only are Megabots giant and slow, but the other team has one too and it will not hesitate to mow you down with the help of his teammates. Humongous death machine or not, you still need teamwork to win! With the new meta, the Legendary gear became this, save for a handful. The weapons in particular are hit with this - they hit like a tank and are usually paired up with an extra one or two launchers. However, they're energy hogs that peter out after a few seconds. On the other hand, players will latch themselves onto the Ghost and Blink devices, mostly because they pair up wonderfully with the Tesla Blades. Artbots, i.e bots designed mainly with aesthetics in mind. They look awesome, but that often comes at the cost of combat efficiency. Beam Spam: Multiple Nano Disruptors (up to ten) could look like this before being reworked to shoot green pluses. BFG: Aeroflak Sentinel, Chain Shredder, Rail Impaler and Ion Distorter are all really big. None of them are quite a patch on the Plasma Goliathon, Aeroflak Guardian or Laser Leviathan guns, which are so enormously huge that they require multiple contact points to keep attached. Blasting It Out of Their Hands: Selective destruction of the enemy's weaponry is a viable tactic; if they loses all their guns, then they can't fire back. Bottomless Magazines: Justified, since all the weapons use energy and not ammunition. However, only the Tesla Slicers and Nano Menders lack energy consumprion, while rest of the weapons will eventually drain out your general energy bar. Boring Yet Practical: Even the smallest green-tier lasers can be viable if used well, as they cost very little to mount and use and can be difficult to degun. Bribing Your Way to Victory: Premium users gain, more or less, twice as many items from crates that they receive. The items that they recycle also have three times as much value as those of non-Premium users. Car Fu: A robot with enough weight and speed can knock other robots around fairly easily. It doesn't do damage, but it can leave them prone for you to start laying on the pain with your guns. Adding Tesla Blades can allow this to do damage, however. Color-Coded Item Tiers: Originally, the various tiers of armour cubes were colour-coded in a fairly arbitrary manner, but when the tier system was scrapped, the game reverted to the standard Grey-Green-Blue-Purple-Orange rarities. Color-Coded Multiplayer: Your team's HUD and projectiles are blue and the enemy's are red. Combat Medic: Some people wielding Nano Disruptors will also compliment them with Tesla Blades or other weapons. In addition to healing teammates, these robots can join the battle on their own, though they prefer to stay behind the bot they're healing and use their weaponry only when it's relatively safe (like finishing off crippled enemies or attacking the Protonite Core, when every single shot is important) or when there's no other option (escaping from the enemy without teammate covering you). Comeback Mechanic: In Battle and League Arenas, if the losing team destroys the Protonite Core, their superweapon's charging percentage will become equal to the winning team's. Competitive Balance: The bots are sorted by their CPU level. The more and/or "heavier" parts your robot has, the higher its CPU level will be. Also, the more CPU robot has, the less it's energy reserve is. SMGs are fast-firing hitscan weapons and can be accurate at a range, but still have huge accuracy falloff the more distance there is between the shooter and the target. Plasma Launchers do monstrous damage that spreads out along their explosion, though you have to combat the arc and low firing rate if your number of plasma launchers is small, making it hard to hit air targets. Rail Cannons excel at sniping and punching through select pieces of cubes, though they take a long time to recharge and have horrible accuracy issues if you're shooting from the air. Nano Disruptors fire a continuous beam that auto-targets to heal teammates, though it has a very short range, and cannot damage enemies or protonium crystals. Aeroflak cannons are excellent against air units, due to their shells exploding when near to an airborne bot (whether due to simply flying, hovering too high, jumping, or falling) and temporarily increasing in damage if you manage to score hits against flying targets in quick succession. However, they have to hit ground targets directly, and the shell doesn't increase in damage after consecutive hits. Tesla Blades do a massive amount of damage and consume little energy. They are also easily destroyed, so stealth and/or flanking is required. Proto-Seeker is a fast-firing weapon with homing projectiles, instant target lock, additional damage against electroshields and it drains very little energy, but it's heavy, has a short lock-on range, eats lots of CPU and does very little damage. Lock-on Missile Launcher fires pretty powerful homing missiles, but it's very big, heavy, eats lots of CPU, has a slow target lock, drains entire energy supply in several shots, and rockets are somewhat prone to flying strange trajectories, which makes hard to hit fast-moving targets. It also warns a target during the lock-on sequence, giving away its user and allowing target to escape. Chain Shredder is a giant rotary cannon. It takes a while to spin up, but when it's running at optimal speed, not many things can survive a stream of bullets from it. However, it's really big, CPU-heavy and drains energy all the time trigger is held, even when just starting to spin. Ion Distorter is a shotgun-like weapon. It does monstrous damage at the short range, but has a huge damage fall-off even at the medium distance, pretty big, heavy, eats a lots of CPU, and drains entire energy supply in four shots. Wheels are a good balance of speed, maneuverability, cost and size, but you need several of them. Hover Blades allow you to hover without being affected by terrain as much as other robots, but having a blade shot off is rather debilitating. Tracks are tough and give you decent speed and maneuverability, but they are big and therefore easy to hit. Skis allow very fast movement, but they need to be paired with thrusters to be able to go forward, backwards and steer in other directions than towards the front. This also makes them less accurate. Aerofoils allow for VTOL along with agile and fast flying, but if they are shot off you'll come crashing down. Helicopter blades allow for stable and fast flight, but they are very large and easy targets, especially for rail guns. Insect legs allow you to climb mountains or even cling to walls or ceilings, but they are not as fast as other options and are not very durable. Mech legs have good mobility and immense durability, but have the lowest speed in the game. Sprinter legs allow you to move at high speeds and have a unique forward-leap ability, but it comes at price of stopping for a short time after the leap and lacking the health of the Mech Legs. Propellers give a slow, but powerful thrust and are mostly used to build either heavy planes or drones. The overall effectiveness of your weapons peaks at having as many of them, as stated in their nominal count. What a Piece of Junk: Some of the unassuming ones can be pretty strong too. Cool Starship: The now-crashed E14's ESS "Vanguard". Robocrafters' Motherships may count too. Covers Always Lie: The robot shown in the image at the top of the page is frequently shown on promotional materials. Neither its decorated blocks, its wheels, the arm on the top or the lasers it uses are parts that are in the game. Critical Existence Failure: Averted. You can continue to lose cubes until your CPU reaches 25% of your bot's total CPU, at which point you die. If you're lucky enough, you can survive with just about critical amount of CPU and, after spending ten seconds without being shot at, regen back to the perfect state. Death from Above: Plasma-toting fliers excel at this. A skilled and accurate pilot can rack up a large number of kills just firing Plasma bombs into the crowd. Death Is a Slap on the Wrist: Depends on the game mode you're playing in. Played straight in the Team Deathmatch and VS AI mode where respawn times are extremely short. Averted in some of the Brawls; once you're dead, you're out of the battle. Downplayed in Battle and League Arenas, where respawn time is set at 15 seconds. Death of a Thousand Cuts: Possible by killing an enemy with low-damage SMGs or proto-seekers. Deflector Shields: Electroshields can be placed onto your robot to serve as these. They are very useful for blocking Plasma and Rails, though a bit less effective versus SMGs. Beware however: once an electroshield takes too much damage, its shield shuts down and has to recharge, during which time it can be blown off entirely if you don't hide. There's also a shield module, which projects a disc-shaped smaller version of the base's fusion shield, that lasts for five seconds. Deployable Cover: The Disc Shield Module deploys a small shield that you and your teammates can shoot through, but your enemies cannot. Do Not Run with a Gun: Accuracy used to be decreased while moving, especially for Railguns before it was later changed so that all guns would be fully accurate while moving. Elites Are More Glamorous: Premium users gain many more customization colors that non-Premium users do not have access to. They also have more additional CPU for cosmetic stuff, which does not count in main CPU bar. EMP: The EMP Module creates a cylindrical area that momentarily disables enemies caught in its radius. Enemy-Detecting Radar: The Windowmaker Module appears as a large radar that shows the locations of all enemies that aren't using a Ghost Module for several seconds after activation. Prior to the Windowmaker's implementation in May 2017 there was a cube literally named "Enemy Radar". There were also the Radar Jammer that screws with the radars of enemies, and the Radar Receiver that shows you what's on your teammate's radars. After the update, a similar system in built into all robots by default. Energy Weapon: All weapons use energy from your energy meter. The meter must be recharged when it runs out before you can use your weapons again. The Weapon Energy Module also refills this when activated; a useful property for weapons such as Ion Distorters, that blow through the entire energy guage in four shots. Frickin' Laser Beams: SMGs are this. They fire in succession, peppering the enemy with laser pellets. Cheap and simple to use, and properly aimed they can eat through armor and even electroplates like candy, though they otherwise lack the raw power of Plasma or Rails. Nano Disruptors used to be this. They fired a continuous beam that heals allies but does no damage to the enemies or crystals. It was later changed to fire green pluses to heal instead. They're also very short-ranged. Fun with Acronyms: The post introducing the Mech Legs gave them the full name "Balance-Assisted-Durable-Auto-Stabilizing-Strider". Also doubles as Getting Crap Past the Radar. Future Copter: Hoverblades provide control by tilting in order to vector thrust, though the vast majority of robots use more hoverblades than the two used in traditional futurecopters (at least four is the usual amount if you want a stable robot). There are also actual rotor pieces which allow the players to fly. Again, while nothing prevents you from building a copter with a single blade, you will generally want more than four. Game-Breaking Bug: As the game has only recently left beta stage, there are still a few. These include: falling through the floor under certain circumstances, server overloads that have prevented players from being able to play, the anti-cheat software locking players out, and so on. Game-Breaking Injury: Downplayed. Depending on how your robot works, getting certain cubes shot off can put you in some... interesting situations. Losing enough wheels or thrusters can severely hamper your movement, losing your aerofoils and rudders can make it damn near impossible to fly straight, losing all your guns prevents you from returning fire, and so on. It's not uncommon to lose all means of mobility and get stranded. However, the auto-regen mechanism allows you to get back to full health if you're left alone for long enough. Gatling Good: The Chain Shredder, and its smaller variant the Chain Splitter. Goggles Do Nothing: Glass cubes are purely aesthetic, they do nothing more or less than standard cubes. Grenade Launcher/Plasma Cannon: The Plasma Launcher is quite obviously a fusion of the two, lobbing plasma globs that explode violently on impact. Very good at taking out whole chunks of robots, though Electroplates can tank them easily enough. They take a few seconds to recharge after each salvo. Glass Cannon: Bombers generally fit this role, although they have an excellent vantage point and can drop massive firepower, they are also extremely open and losing even one wing can be a death sentence. Artillery also fits, you can easily disable or destroy most bots in one hit, but you will be left defenseless for the long reload. Healing Shiv: The Nano Disruptor, which fires a constant short-range beam can repair and replace an ally's cubes that have been destroyed in battle. Homing Projectile: As long as the Missile Launcher stays locked on to a target, its missiles will hit something. The Proto-Seeker bullets are similar in this, but their homing abilities are limited and they tend to miss if fired at extreme angles in short-range fights. Improvised Armor: Failing stacking cubes or electroplates, the various hardware you can put on your robot can also serve as armor. Invisibility: The Ghost Module allows the user to become invisible until available energy runs out. Junk Rare: The Legendary-grade Wheel Monsters. Wheels are received individually from crates and you require at least four to properly run a wheelbot (Two of which need to be steering-type); with the rate that Legendary parts drop at, chances are you're hoping for a more significant part such as an Ion Distorter or module rather than the disappointing sight of something that will require dropping an extra 150K Robits to be at all useful, an issue compounded by the fact that wheels are and have historically been very bad in the meta. Kill Sat: Used to be a Fan Nickname for a robot design that uses helium cubes to levitate itself to a great height (they thus work more like zeppelins than satellites, though they tend to resemble the latter more), then uses Rail Cannons to snipe at enemies. While now less effective (due to improved anti-air weaponry such as Aeroflak and LOM Ls), heavy copters and propeller bots still exist and can throughly ruin your day. Laser Blade: Tesla Blades, at least in name. They take the form of a line of electricity kept active by two tesla coils that shocks the ever-loving hell out of the enemy that touches it. Lighter and Softer: Compared to Crossout, Robocraft's Dueling Game. Macross Missile Massacre: The Lock-On Missile Launchers. Mighty Glacier: Tank Treads are the heaviest and second most well-armored method of locomotion, but also the second slowest. "Landships", a common top-tier design, are enormous tanks with thick spaced armor that makes them very hard to kill, but they're also usually very slow and cumbersome. Mech Legs skirt the line. They are more agile than Tank Treads and even more tanky, but are very large. Misguided Missile: Making oneself invisible automatically disables the Missile Launcher's lock-on. Hiding behind cover or otherwise having the shooter lose sight of the target also disables the lock-on. Missile Lock-On: The missile launcher must lock-on to an enemy before you can hit them. Proto-Seekers also lock on, but don't alert the target that this is happening; chances are, they'll already know. No Ontological Inertia: Done quite literally. 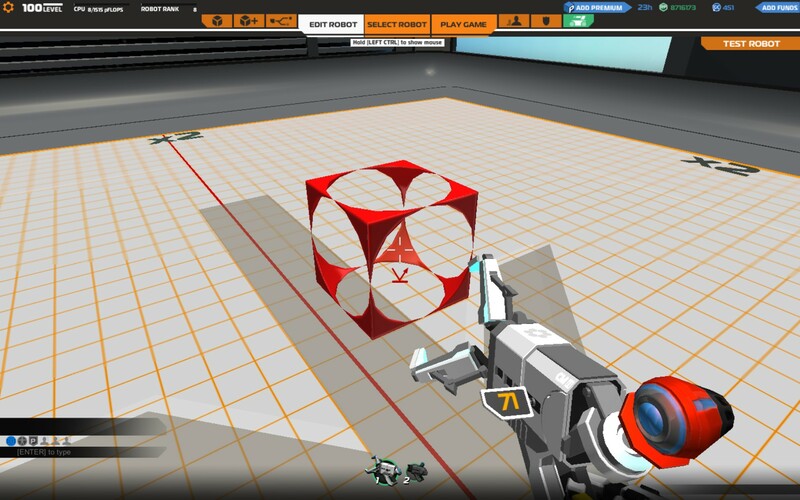 If by losing a cube the bot is split into two or more parts, only the part with more CPU stays while the rest is immediately destroyed. Outside-the-Box Tactic: The best way to disable a robot is not to aim at its functional parts, but to instead aim at the armor cubes those parts are sitting on; the armor cubes themselves, despite their name, are actually less durable than most weapon/movement cubes. Conversely, constructing a robot with proper armor means hiding those cubes behind other cubes or electroplates as much as possible. Orbital Bombardment: The goal of Battle Arena is to charge the Annihilator weapon of the team's spaceship, so it can blow the enemy's reactor up with a single shot. Also, your Mothership can fire a powerful Electromagnetic Pulse, if you equip your robot with the EMP Module and use it to designate the target area. Ramming Always Works: The entire idea behind Tesla Blades is to drive them into the enemy, which does a massive amount of damage. A robot covered with Tesla Blades all over is not something you want to let near you. Ridiculous Future Inflation: In-universe, price of a single copy of "Robonews" mostly fluctuates around several tens or hundred-something thousands of dollars (it may have something to do with it being "printed on authentic recycled Earth tree paper from the 20th century") and the "Daily Robot" can cost up to $541,752.14 per copy of 12/01/2152 issue (though this one may be justified by being printed mere days after the end of the CF-Alliance's civil war). Royals Who Actually Do Something: According to the "Daily Robot", Child-Emperor J. Bentley-Allen the Liberator composed his first symphonic opera at the age of five, mastered over a dozen of musical instruments and is also skilled pilot and tactician, who personally planned retaking the capital and led it from his prop-driven plane. Short-Range Shotgun: The Ion Distorter and Ion Destabilizer. Shout-Out: Emperor Fanelli and Lord Adsoy's duel is very similar to the fight between Emperor Palpatine and the Darth Vader at the end of the Return of the Jedi. Sniper Duel: Happens frequently between two Rail Cannon users, usually either ending with the Cannons blown off or a good killing shot to a critical connection point. Spider Tank: Can be built using the Insect Legs. What happens when a bot's health reaches zero. In Battle and League Arenas, a battle always end with the losing team's reactor violently exploding. Super-Persistent Missile: Missiles will turn around and try to hit the target until they succeed or hit something else. Tank Goodness: Tank tracks allow you to build... well, tanks. Teleportation: The Blink Module allows the user to teleport to where his or her crosshair is pointing at. Also, that's how the robots get into battle in the first place. Despite the obvious issues that would arise in reality, there was no penalty for completely encasing the Pilot's Seat in armour, even when it was an actual seat for a pilot instead of an AI remote terminal. Now that that's been removed, there's not even an ethical reason to not armour up as much as possible. Copter blades do not care about center of mass. A huge chunk of armor blocks with rotors at the back will fly perfectly fine. Wave Motion Gun: Rail Cannons start out as small-scale versions, but gradually get big enough to fit the trope wholesale, and they hit every bit as hard as one. Rails will easily punch through a robot lacking on armor, possibly even scoring a One-Hit Kill if you can nail a critical connection point. These take quite a while to recharge after the energy is expended however, so be ready to run and hide after you're delivered your payload.